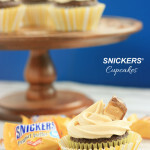 A cupcake recipe that uses the new Snickers Peanut Butter Squares. 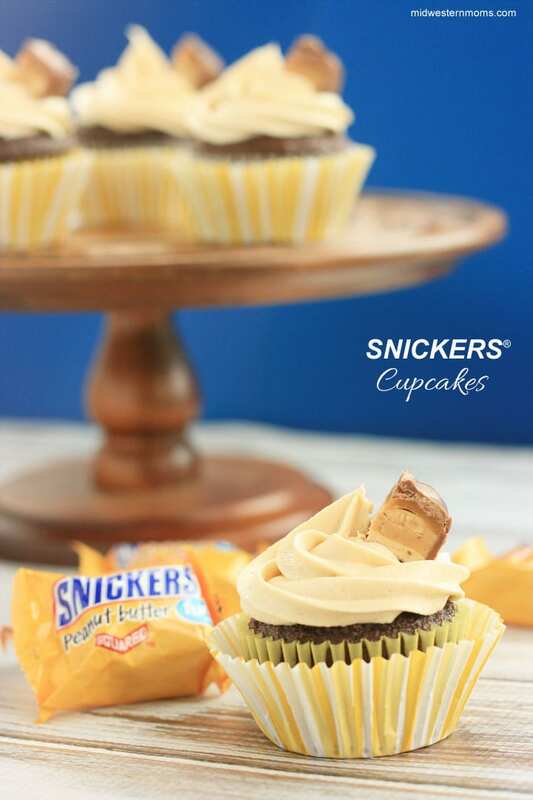 These delicious Snickers cupcakes will not disappoint! Simply made with a doctored up dark chocolate cake mix with delicious caramel buttercream frosting, topped with a bit of Snickers Peanut Butter Squares. When hunger strikes, we may get a bit short and cranky. I have been there plenty of times. Being a mom, I have eaten my fair share of cold meals to make sure the kiddos get fed. However, today I want to share a story about my youngest son. On Easter weekend, we traveled to my parents’ home. The trip up was fairly uneventful and the kids took their naps as we drove. We arrived about 5 o’clock, and my sons usually eat dinner around 4 o’clock. The youngest was fine as long as the vehicle was moving, but started to make a little noise as we pulled in the drive. We started unloading and got the kids inside the house and my Dad, aka PaPa, was there waiting for us. My oldest son headed to the back room and proceeded to drag out all the toys to play. I put down my youngest son and he was just standing there, checking things out. My husband and I go back out to the vehicle to bring the rest of the luggage into the house. We get back inside and my youngest is just crying his little heart out. Poor Papa was trying to get him to calm down but nothing was working. Once my husband and I got everything inside, I fixed the little guy a snack and all was well. He went back to Papa and wanted to be held. I got supper going shortly thereafter and, once fed, he was a happy boy until bed. 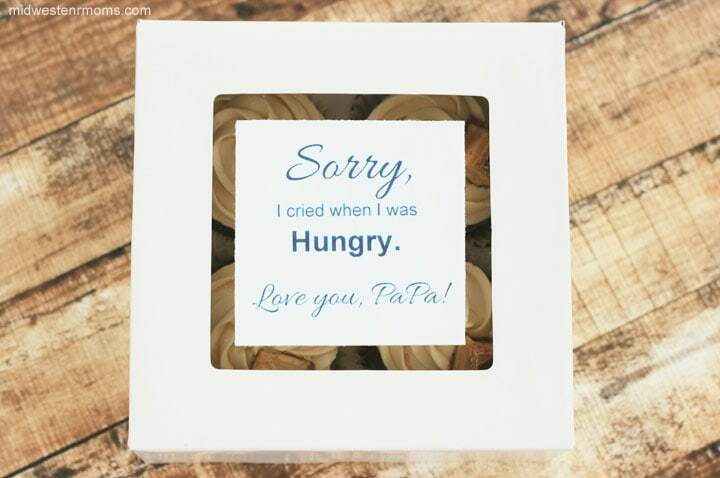 So, when we got back to our own home, I decided that PaPa needed a little something to say “Sorry” for how my little guy was when he was hungry. What better way to fight hunger and say sorry than with cupcakes? 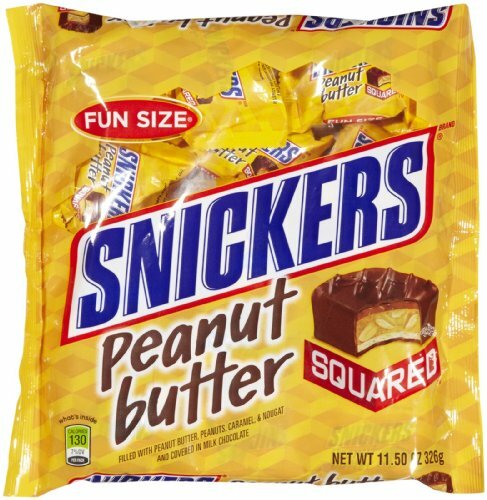 So while I was at Dollar General, I picked up some SNICKERS® Peanut Butter Squares and Almond. Pretty easy to find in the candy aisle of the store. I have shipped cupcakes before but this time we added a bit extra to the package. I put the cupcakes into a nice box made for transporting cupcakes. This box held four cupcakes. It has a nice tray inside to help keep the cupcakes in place as they go through the mail. Once I got the cupcakes all packed into their box, I printed a little note to add to the top of the box. Once the cupcake box was placed into the shipping box, I added a few of the of the SNICKERS® Almond and Peanut Butter Squares on top of the box. Now PaPa will be set for when hunger strikes him. Dark chocolate cupcakes with caramel buttercream frosting and Snickers Peanut Butter Squares. These cupcakes are to die for! Delicious dark chocolate cupcakes, topped with caramel buttercream frosting and Snickers Peanut Butter Squares. Mix all ingredients with a mixer for about 2 minutes or until well mixed. Line your cupcake tins with liners. Fill your cupcake liners with just a little over 2 teaspoons of batter. Bake at 350 for about 18-22 minutes. Cream the butter, caramel topping, and salt in your stand mixer. Place the frosting into a piping bag with your favorite tip. Pipe onto the cupcakes once they are cooled. Garnish with a quarter of the SNICKERS® Peanut Butter Squares. I just saved a bit of my morning coffee to use. You can always warm it up in the microwave. If you are not a coffee drinker, simply use 1/2 cup water. 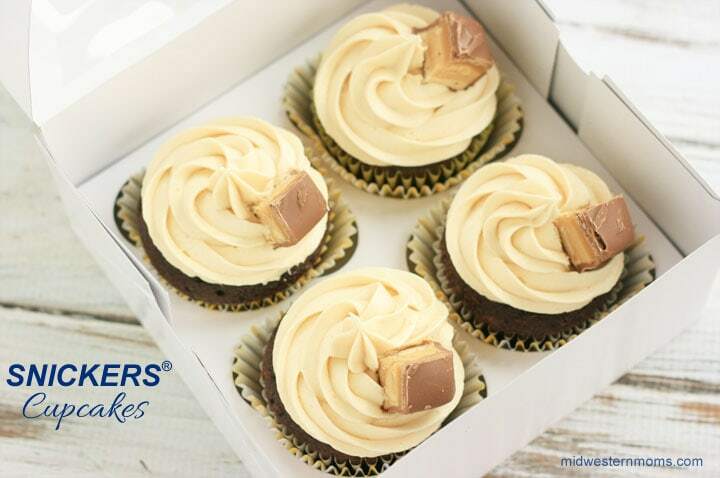 Place your SNICKERS® Peanut Butter Squares in the fridge while you make the frosting. This will allow you to get a nice clean cut. 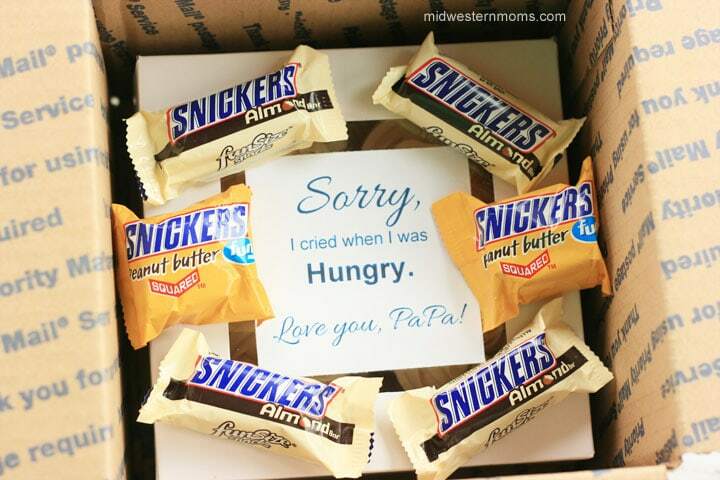 I’m really sad, crying, and cranky – will you send me some? These look so delicious. 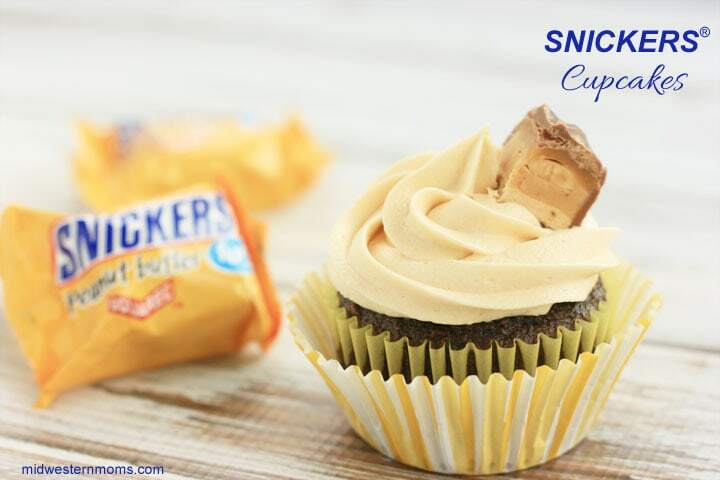 I can only imagine how tasty a cupcake would be with snickers added in. And I love the little apology you put with the cupcakes. Definitely need to try out this recipe soon. Wow! I cannot wait to make these! Thank you for sharing your awesome recipe at Tickle My Tastebuds! Your recipe will be featured this week! I can’t wait to see what you share this week! I’m so drooling for this. Sumptuous! Hi there! Visiting from Worthwhile Wednesday. This looks so yummy! Thanks so much for sharing! What do you mean by 1/2 warm coffee. A 1/2 cup? Thank you for catching that Becky. Yes, it is 1/2 cup of warm coffee. I have made the change in the recipe. Thanks for stopping by! This recipe sounds so wonderful. I will have to try this. Thanks for you idea! Oh my! These look so sinfully tasty! That’s so sweet of you to send them to your PaPa! Thanks for sharing your recipe at Inspire Me Mondays!